Isaka: How did Drucker spend his youth? 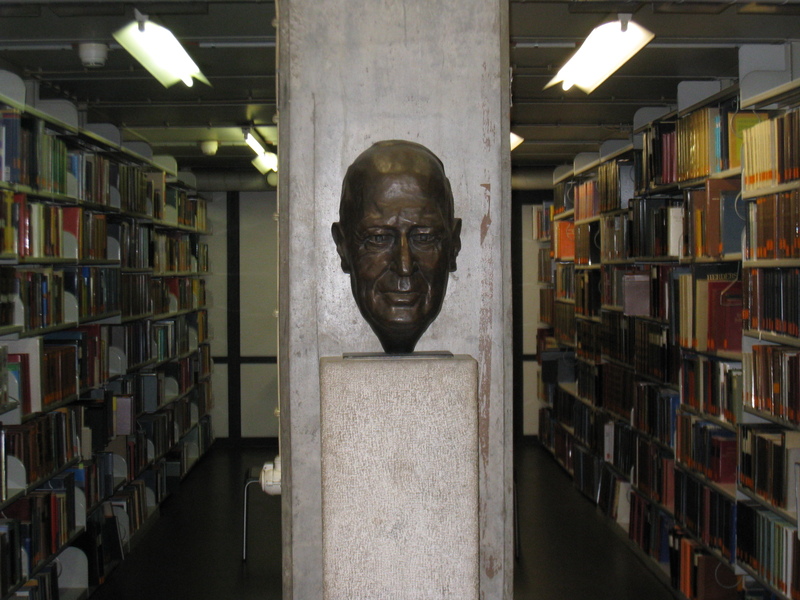 Drucker has had vision, analytical faculty and a volume of knowledge since youth. Besides being genius-like smart, he studied very hard. After graduating from high school, being bored in a classroom and anxious to get into the real world, Drucker left Vienna, and went to Hamburg in Germany where he got a job in a trading company. He enrolled at Hamburg University not to disappoint his family that had been involved in academic, medical and governmental fields. But he spent most of his time in the library every day after work. After a year or so, he moved to Frankfurt and took a job in a securities company while he enrolled in Frankfurt University. Still only at the age of nineteen, he wrote a thesis in an economic magazine in which he predicted the market growing. However, right after his thesis that was based on the latest theoretical model and data was published, the Great Depression started. He has never made predictions based on theories, especially mathematical models and data since. After the securities company became bankrupt, he started to work as a journalist. He wrote two editorials on the first day of his work and was soon promoted to a senior writer for international and financial issues. He says it was not that he was extraordinary competent, but so many working men aged between thirty and fifty were lost in World War I and young men like him ended up getting hired and promoted. But I know that not so many people could have done what he did. Drucker is sometimes too humble. Drucker decided that he should know everything what a journalist must know. Once, Phidias, a Greek sculpture, who created the statues on the roof of the Parthenon, remarked to an accountant in Athens who had refused to pay him full saying that nobody could see the back side of the sculptures, “The gods see them.” This was Drucker’s motto in his youth. Drucker received a doctorate at the age of 21, and even taught a class sometimes to substitute for a head professor. Incidentally, one of the students in the class was Doris Schmitz who would become Mrs. Drucker. Later in London, they happened to meet in passing on escalators in the subway station at Piccadilly Circus. From thence their courtship began. When in Frankfurt, he declined the offer by one of his schoolmates, who later became one of the Nazi senior officers, to enroll to the Nazi party. Also, he turned down a job offered by the Nazi Intelligence Office. On the contrary, already being concerned with continuity and change of society, he wrote a thesis on Friedrich Julius Stahl (1802-1861), a parliamentarian and a founder of Justice State, the law-abiding state as a continuing society. It was chosen by the distinguished publisher, Mohr in Tuebingen, as its 100th volume in a political and legal booklet series. Stahl was a Christian, but also a Jew by heritage. The Nazis could not tolerate an essay that gave credit to a Jew. In fact, after two weeks of Hitler’s seizure of power, it was banned and burned. As a conservative Christian who believed in constitutionalism, Drucker knew that he could get along neither as a writer, teacher nor anything else there. He went to England. Drucker has had excellent structural and analytical faculty since he was young. And yet, he has been preaching the importance of perceiving things as a whole. Recently, he affirms that all of the important tasks in the 21st century such as environmental concerns, developing countries’ issues, and educational problems could be solved only by the ability to grasp the whole as a whole. He says that perceiving is more important than conceiving, observation than analysis, that is the right side than the left side of brain. Some people say Drucker is not good with numbers. That is absolutely out of the question. He used to teach statistics in college. The reason why he does not make much account of numbers is that when a phenomenon turns into numeration, it is always of the past and not important for the future. The important factors that change tomorrow will not conduce to quantification. When Edwin Reischauer, former U.S. Ambassador to Japan, wrote that the Japanese were weak in conception and analysis, Drucker told us that it might be true but at a time when an enormous theological system was composed in Europe, “The Tale of Genji,” the masterpiece of perception, was created in Japan. This may reveal a part of the reasons of his affection and expectation toward Japan. Drucker’s knowledge and collection of Japanese paintings, especially “sumi-e” or black and white drawings, is first class. His collection was once open to the public at department stores in major cities in Japan. He used to be a visiting lecturer for Oriental Arts in Pomona, California. According to him, Japanese paintings and Chinese paintings look similar but are fundamentally different. The Chinese become uncomfortable when confronted with Japanese paintings. The thing drawn in Japanese paintings is space rather than objects, he says. To begin with, the first encounter of Drucker and Japan was an exhibition of Japanese paintings at a gallery in London. He dashed into a gallery seeking a shelter from rain and had a tremendous impact there. Since then, he has been captivated by Japanese paintings. At that time, he had a strong interest in the country named Japan. Isaka: How does Drucker grasp the fundamentals of Management? In old days, it was the reign of kings or feudal lords that decided the happiness of the people. Thus, education of the ruler was created. As for a company, up until recently, it was also the CEO’s management that decided not only the contribution to the society and the destiny of the company but also the happiness of the employees. It was the leader’s ability that destined the success or failure of the organization. Drucker says it cannot be like that any more. Every member of organizations has to learn education of the ruler to behave himself. He needs to act like a president. The book written as an education of the ruler for all the people, published more than thirty years ago, is “The Effective Executive” (1969). It was reprinted and read extensively today. It is the knowledge of management that is education of the ruler in modern times. Drucker teaches us three roles of management. The first role is to accomplish the function that is specific to each organization; in other words, to contribute to society through its business. If it is a newspaper company, it is to publish the best paper. If it is a greengrocery store, it is to supply the best vegetables. It is only a monastery deep in the mountains that does not have to contribute to society directly. It is only a gangster connection that does not have any intention to contribute to society. All other organizations must contribute to society, because they are allowed to exist, occupy, and hire the most valuable in society. The second role is to make work productive and people achieving. Man as a social existence seeks to exert his ability fully, to fulfill his potential, and contribute to society. Especially from now on, we will enter an age when people will leave an organization that cannot make work productive, and satisfy them in achieving through their strengths. The third role is not to give any negative impact on society, and to contribute society in solving its problems. This is so-called the social responsibilities of the organization. The first social responsibility of organizations is to eliminate any negative impact to society caused by its existence and activities, or at least to minimize it. If a noise is produced during the process of production, it has to be reduced as much as possible. Traffic stagnation might be caused in neighborhood. It has to be eliminated. Drucker says the organization has to eliminate or at least to reduce these nuisances as much as possible. Furthermore, the responsibility of organizations is to solve social problems by mobilizing its strengths. And, to make the problem- solving into a business if possible. In any industries such as power companies, automobile companies, convenience stores, hospitals, etc., the business itself started fulfilling social needs. It is true to any business. These two responsibilities make up the social responsibility of organizations. Drucker affirms strongly that there are not any special responsibilities, called the social responsibility of business. It is politically wrong to give any special responsibility to anyone, or to any organization. In Europe, such an idea was discarded a long time ago, even before modern industry was born. Pascal, well known by his “Penses” (1670), pointed this out. If special responsibilities were laid on, special powers would be given. As powers are accompanied by responsibilities, responsibilities are accompanied by powers. For management, profit is a requirement to achieve these three roles. At the same time, it is a scale to measure its achievement. It is not a purpose. A requirement is harder than a purpose. A scale is also harder than a purpose. During my thirty years in Keidanren, so called the headquarters of the Japanese business, I have never met a single CEO who said he worked for purpose of moneymaking. Drucker says there is no such thing as profit motivation. Profit is a cost that a company as a public institution needs to achieve its roles. It is a requirement. It is a standard to judge its achievement. Drucker says profit is, first and foremost, a cost for today and tomorrow. Fortunately, it fulfills the role as a measurement to know how the organization functions well. According to Drucker, it is dubious that a desire called profit motivation exists. It is only an assumption of classical economics that could not explain the cause of economic activities. In psychology, there are materialistic, sexual and other desires, but no profit desire. Running a business for profit motivation would end up as running a business for greed. Moreover the word profit motivation causes needless misunderstanding and antipathy against business activities. Sadly, even though a top executive himself is not working for the purpose of moneymaking, he uses the word without giving it much thought. The merit of organizations in the form of business is that the scale called profit exists. The function of bankruptcy is inherent. It is the most excellent merit for the corporate institution. The public was right when it got angry about the idea of the government’s pouring money into “Jusens,” Japanese housing loan companies a couple years ago, and more recently Sogo, a department store on the brink of bankruptcy. Bankruptcy is the proof of mismanagement. Drucker says the possibility of bankruptcy, as a result of mismanagement, is a remarkable aspect of the free market system. When I learned it from Drucker, to be honest, I was so impressed. What Drucker says is always common. It is rather a forgotten common sense. In being common, Drucker has the power of uncommoness. That a top executive has led a company into bankruptcy means that he has failed to make his business contribute to society and to make workers who are precious existence in society achieving, and also it means that he caused harm to society. He could not accomplish any of the three roles. Even though how he excused himself that he had no choice in the bad economy, it is the uttermost irresponsibility. Drucker says, adding to those roles, there is the ethics for the professionals. It is “not knowingly to do harm.” This is the doctor’s ethics called the Hippocratic Oath from the ancient times. And this is exactly the ethics for professionals. Here is also the power of the common sense. However, these days in Japan, several misdeeds causing harm knowingly have occurred. Drucker would say they are the biggest sin. Contributing to society through business is to serve society’s need. The bottom line is to create customers and to satisfy them. The essence of Drucker’s theory of marketing lies here. According to Drucker, the customer is the one who buys goods and services, and who comes to a hospital to be cured, and who attends a class to learn. In other words, attention to non-customers, those who should be their customers but not yet the customer is the key to the future of a business. There are lines of activities and companies declining because they did not pay attention to non-customers. Change starts from non-customers. It is Drucker who clarified the concept of the non-customer and its importance. Department stores had enough information about their customers. They, however, did not know non-customers, working women who were not able to shop during its business hours. When the department store noticed that, it was too late. One of Drucker’s sayings, “The purpose of business is to create customers” is extremely well known. Creating and satisfying a customer is marketing. Marketing is not the generic name for sales activities. Eliminating sales activities is the ideal of marketing. On the contrary, the consumer movement is a shame of marketing. I have heard it from Drucker that any kind of function can be subject to outsourcing. Any function can be outsourced. Research or accounting is not exempt. Then, what function remains that is not subject to outsourcing except top management? The answer is marketing. Only marketing is the essential function for any kind of organizations. Drucker continuously states that the raison of the organization lies in the outside world, and the success of the organization also lies in the outside. The organization is for the purpose of functioning in society, not for the purpose of those working there. However, this is forgotten. The thought that puts emphasis on one’s company rather than on customers, or one’s boss rather than the function of the company cannot lead to success. This is true for any kind of organizations.